Wash and pressure cook dal in two cups water. Cool, remove, drain and keep aside the top water of dal. Remove two tbsp. Thick dal and keep aside. Beat the remaining dal with a hand whipper, adding the water that was kept aside. Crush the green chilli and ginger together. Make a paste of all the dry powders in 1/4 cup water. Keep aside. Heat ghee in a saucepan and add the seeds. Add ginger garlic and stir. Add asafoetida, mint, masala paste and stir for a minute. Add jaggery, tamarind water and stir. Allow to cook for 2-3 minutes. Add beaten dal. Boil for 6-7 minutes. Check taste for salt and spiciness. Garnish with chopped coriander. To be served with hot steamed rice. To serve, place one serving of rice on a plate. Top with one tsp. Of thick dal kept aside. Lace with 1/2 tsp. Desi ghee. Serve along with a serving of the dal. 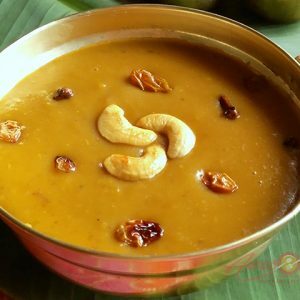 Feel free to comment or share your thoughts on this Sweet Sour Dal Recipe from Awesome Cuisine.